I actually put this site up last week and tweeted about it then, but for long-term reference I'd like to announce that my Demos site at http://quicksketch.org/demos is now back up and on Drupal. So far I've got demos up for some of the major modules I've writen: Form Builder, AJAX Poll, Image Resize Filter and Insert. My first book, "Using Drupal" will be shipped December 16, 2008. I co-authored the book with several other incredible Lullabots: Angie Byron, Addi Berry, Jeff Eaton, James Walker and Jeff Robbins. I'm very, very excited about the release of this book, not only because it's the first one I've authored, but because of the subject matter covered. There are several other books on Drupal (including the excellent Pro Drupal Development book, also authored by Lullabots John VanDyk and Matt Westgate), but none of them approach Drupal with such comprehensive coverage of actually using the software to build websites. 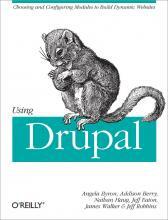 It's also the first book to extensively cover contributed modules in addition to Drupal core. Despite having worked on the book for well over a year, it's hard to believe it's really here. Today I received a newsletter from O'Reilly containing my biography for the book. The book is already available through O'Reilly's excellent Safari service. I haven't received my physical copies yet, but I guess it's already undeniable that the book really is finished and one more life goal accomplished. Here's my bio on O'Reilly.com. You can pre-order Using Drupal from Amazon.com.